For spending quality time with Master Z. Technology has us wrapped around it’s finger, and I am as guilty as the next mother for letting it take away my attention from my little one. So let’s take a moment, to put our phones down and listen to them. Play with them. Laugh with them. Celebrating Master Z’s 3rd Birthday! Yes, he is THREE! He was spoilt with gifts, a home made chocolate cake and then a lovely family dinner at Farzi Cafe. I also wrote him a letter, like every year, which you can read here. Heading to Fujairah for a 2 day break, where myself, Master Z and Mr Z simply lazed around in the pool the entire time. It was the best staycation we have had yet, because Master Z is at that semi-independent age where he is happy to be doing his own thing and is so confident in the water. For when Allah answers your prayers. Alhumdulillah ten times over. Finding your group of GENUINE friends. They are hard to sift through, and it is an ongoing process, but they are present. You just need to find them, and then stick with them. Like Forever! Meeting new people and exchanging different ideologies. It is the best way to learn, in my opinion. For not being in my baby brother’s (Mr A) position of giving his A Level exams back in the UK. Boy, am I glad THAT chapter is behind me! 😛 But all the very best to him and all others going through it of course! hehe! For being able to witness yet another Ramadan. Ramadan Mubarak! I hope you and your families have a blessed month, filled with reward and good intentions. For the overwhelming positive response to this Ramadan Video that myself and Tani of Our Big Dubai Adventure created, explaining what is Ramadan to our little ones. Feel free to carry on sharing the love, and letting us know if your kids found it useful! For Iftars with the family. You can’t really beat the Iftars at home, but if you are looking to enjoy or host an Iftar or Suhoor at a restaurant, check out some of my recommendations. I am hoping to add to the list as the month goes on, so do let me know your preferences too! 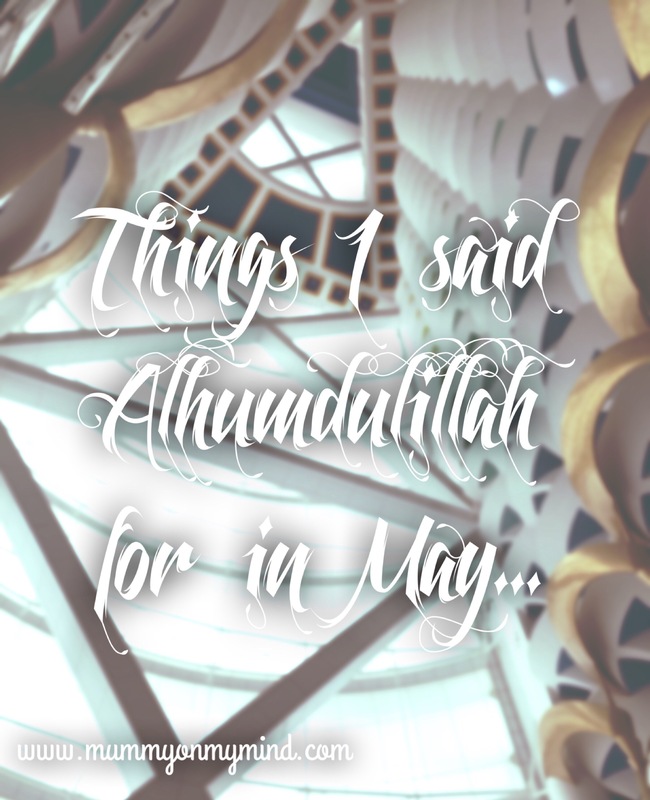 These are just a few of the many times I uttered the words Alhumdulillah this month. Check out what I was thankful for last month here. Also, here’s a list of what I was thankful for in May last year! What are you thankful for? Feel free to share your moments in the comments section below!